Kicking enthusiasts were dealt a serious blow when FanDuel recently gave it the boot in favor of adding a flex spot to lineups. As the majority of degenerates celebrated, some of us like me mourned and wept bitterly in a corner for the small advantage I felt I had in DFS has now gone up in smoke. Ok, I get it… my tear-jerking tale means nothing to you as most either want kicking removed from your leagues or you blindly choose one of these brave booters from a dart throw or asking your spouse before kick-off on Sunday. Before you completely write off the lack of significance and randomness to this position, give yourself a second to breathe deeply and say these words: my league rules says I need a kicker so a good kicker I shall need. I wrote an article before last season, How to Dominate the Kicker Position in DFS, which highlighted some of the trends and statistics that owners should keep in mind when selecting the ones who put the “foot” in fantasy football. I’ll review some of these main kicking factors and then quickly highlight the Ballers’ top 15 ranks. 1. Live and die by the schedule. Streaming your kicker is completely a matchup-dependent decision. Changing your a kicker week-to-week should be in your arsenal especially when you see high-powered offenses face off. For instance, Week 1 gives you the opportunity to take a shot on the up-and-down Texans kicker Ka’imi Fairbairn against New England’s porous defense. In 2017, He had 2 top 3 finishes in Weeks 3 & 4 and was fantasy’s 4th overall kicker for the first quarter of the season. However, from Weeks 5 to 17, he was the 23rd best kicker finishing outside of the top 12 in 10 of those 12 games. Using him in the right matchup instead of sticking with him all season is how to use these footies best. 2. High-volume passing offenses rock for kickers. The way a kicker piles on the fantasy points is opportunity. Yet. opportunity comes knocking especially with high-powered offenses who aren’t afraid to throw the ball 40+ times a game. If you were to look at last year’s top-5 kickers, you’ll find they happened to be on team’s that were among the top-10 of passing yards per game. 3. FG accuracy isn’t the #1 telling factor. According to a regression analysis in 2013 investigating the science behind the fantasy kicker, FG accuracy is a less telling fantasy statistic compared to other factors. The study found that total points scored, scoring rank, wins, QB passer rating and QB passing yards all held much more weight in terms of revealing kicker kick-assness in the fantasy football world. Of the top 12 fantasy kickers from 2017, half of them finished outside the top 12 in terms of accuracy. If you are wild enough to peruse kicker stats from last year, please set aside FG accuracy as a less important skill. Anyone hitting over 82% of their attempts is a viable option. 4. Vegas lines are your kicker’s best friend. If you’re not paying attention to Vegas, now is the time to take notice that these lines are extremely valuable for giving us an informed piece of the puzzle. Vegas books live and die by these numbers so this isn’t Jo-Somebody with an internet connection and a Geocities website ready to give their opinion. When Vegas starts drawing totals upwards of 46, there are points to be scored in bunches. That seemed to be the breaking point last year as you look specifically at favorites on teams with high projected totals. Why pick the favorite? Because what we find is that teams with positive game scripts will often settle for FGs when ahead as opposed to pushing the limits for a TD. Peruse the Vegas lines before selecting your weekly waiver wire kicker and find out who is a home favorite. Teams that are notoriously lights-out at home (i.e. the Patriots at Gillette, the Steelers at Heinz or the Packers at Lambeau) should be in major consideration. Select a kicker from a road underdog ONLY if you think the point total will take the over. Don’t try to predict game flow or guesstimate that the Eagles will continually be stopped at the 30-yard line on all their drives setting up Jake Elliott. Follow the lines. 5. Don’t get cute. Draft kickers at the end of your draft. According to FantasyFootballCalculator.com, 7 of the top 12 kickers in final rankings of 2017 went UNDRAFTED on average, 1 more than 2015 and 2016. In other words, don’t worry about “reaching” for a kicker when streaming the position could help you find the #1 guy (Zuerlein) on the wire. In 2017, there were 39 different kickers who registered a top 12 weekly performance. To compare, only 36 total kickers had an attempt in 2016. For fun here are the Ballers’ consensus kicker rankings and a note about last year’s performance found in the article, 25 Boom-Boom Kicker Stats from 2017. Note: Scoring for kickers varies across formats and websites. For standard scoring, 3 points for FG made and 1 for every extra point. For “bonus “scoring, 3 points for a FG <40, 4 points for 40-49 yards, and 5 points for 50+ as well as the 1 for XP. 1. 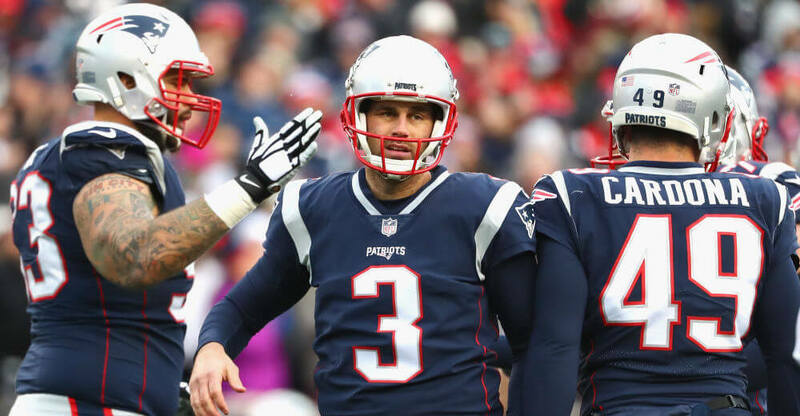 Stephen Gostkowski– Gostkowski attempted the 2nd most FGs (40) of his career finishing with the 2nd most fantasy points of his career. 2. Justin Tucker– He finished with the same exact fantasy total as 2016 in standard leagues (141), tied for the most in his career. The guy finished in the top-5 in bonus formats 5 times on the year. 3. Matt Bryant– He finished as a top-12 kicker 11 times on the year in bonus leagues, a drop from a league-leading 14 in 2016. He was the 4th overall kicker, only 17 fantasy points less than last year’s record-setting performance. 4. Greg Zuerlein-Zuerlein led all kickers with 8 top-5 weeks. His 13.0 points per game are the highest ever in a season with a minimum of 6 games played. 5. Will Lutz– He turned in a solid sophomore campaign leading the league with 47 extra points while finishing with the 7th most total points (140). His 273 total points are the MOST for the 1st 2 years of any career. 6. Jake Elliott– The rookie from Memphis kicked the longest FG (61 yards) ever for a rookie, an Eagles kicker and for the year to beat the Giants in Week 3. He averaged 9.9 bonus league points per contest, 9th best in the league. 7. Chris Boswell– Connected on 35-of-38 attempts last year on one of the league’s highest-scoring offenses. Also, the kicker taken most by the Ballers in mock drafts this offseason. For whatever that’s worth. 8. Matt Prater– Kicking indoors helps Prater maximize himself as an excellent kicker in bonus formats. His 5-for-5 Week 8 game against Pittsburgh last year titled many fantasy opponents last year. 9. Mason Crosby– Crosby had the worst season of his career finishing with only 78 standard points. He should return to form in this Aaron Rodgers-led offense. 10. Harrison Butker– His 38 made FGs last year are the most ever for a rookie. 11. Dan Bailey– He missed 5 weeks last year with an injury but is among the most accurate kickers of all time. This Cowboys offense has taken a step back so he doesn’t have the ceiling he once had. 12. Adam Vinatieri– Unstoppable. Immortal. Vinatieri will do this until he dies. He’s closing in on Morten Andersen‘s record for most points in a career. The Colts offense, on the other hand, is still a mystery with Andrew Luck at the helm. 13. Graham Gano– Gano led the league in FG accuracy at 96.67%, a huge jump from his 81.7% career rate. Despite his preciseness, Gano actually finished outside the top-12 in bonus leagues. 14. Daniel Carlson– The 5th round rookie out of Auburn finds himself at the right place at the right time in Minnesota. Despite 2 misses in Week 3 of the preseason, he’s going to be a relevant fantasy kicker. 15. Ryan Succop– His 42 attempts were tied with Butker for most in the league as Succop had the best season of his career. With exciting new OC Matt LaFleur taking over play calling, Succop is worth a shot to start the year.